Hi everyone! It's Sephi here! 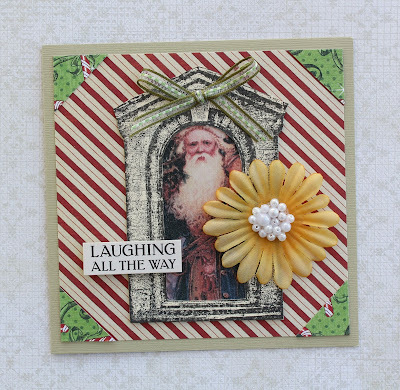 If you're running out of creative steam and struggling for Christmas ideas, here are four Santa cards with a vintage twist. 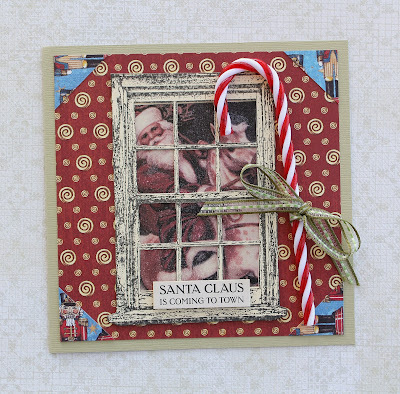 I used a combination of Dear Santa paper products and frame stamps to build the cards, as well as festive embellishments like luscious red candy canes and delicate pearl-filled silk flowers. These cards are a cinch to make; the time consuming part is hand-cutting the frames, but the effort is well worth it because they look fantastic paired with the photochips. 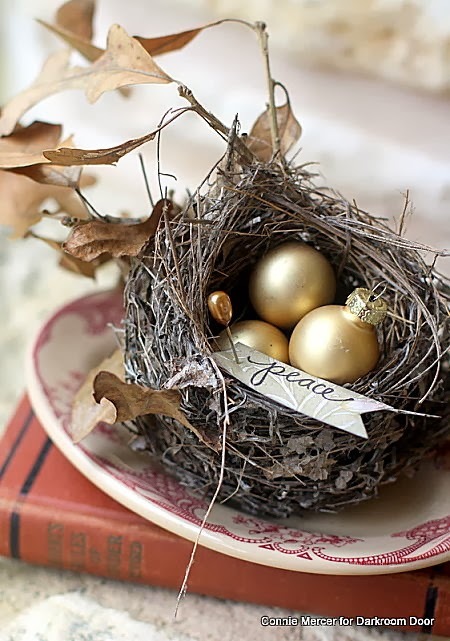 Enjoy and have a very Merry Christmas! 1. 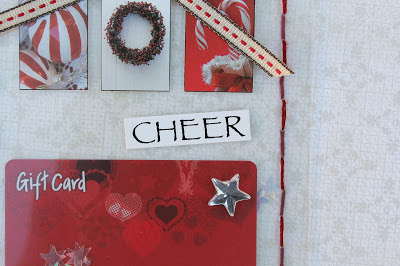 Affix patterned paper to the card fronts. Cut four small triangles from the reverse side of each sheet of paper and adhere them to the corners of each card. 2. Stamp the frames on cream card using black ink and carefully cut-out. 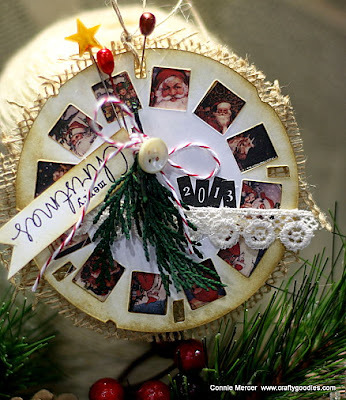 Adhere a Dear Santa photochip behind each frame before attaching them to the cards. 3. 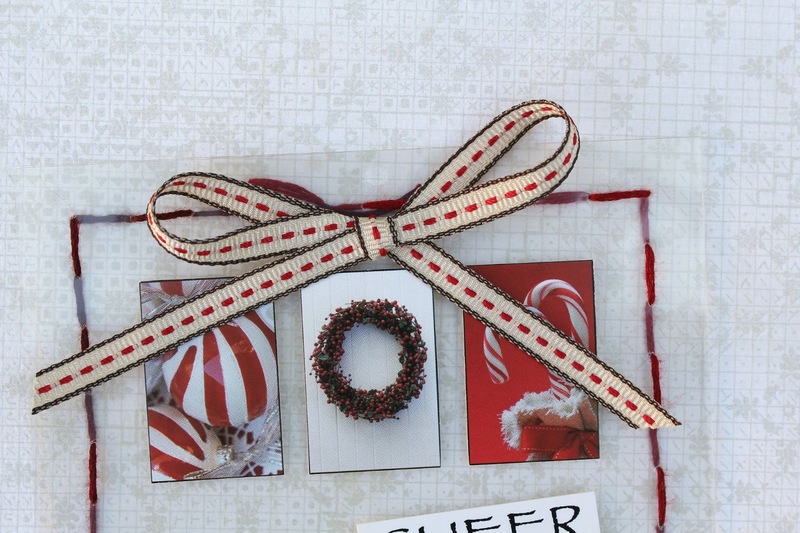 Embellish with ribbon bows, plastic candy canes and pearl-filled silk flowers. 4. 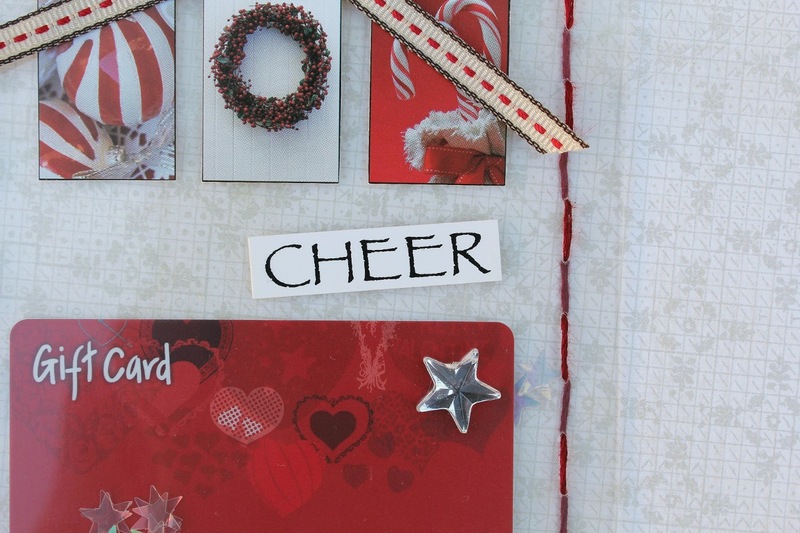 Affix a Dear Santa wordstrip to each card. Hi stampers! It's Sephi here today! 1. Fold 300mm x 120mm acetate in half and mark a point every 10mm around the perimeter. 2. 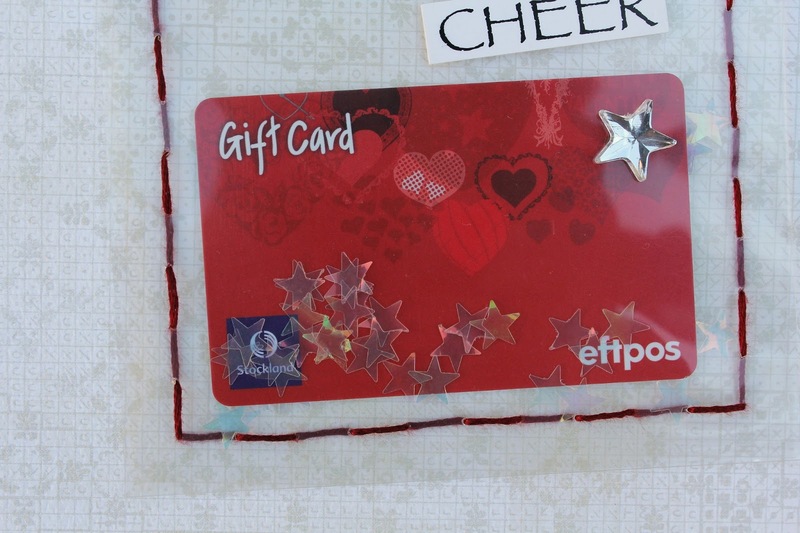 Position the gift card inside the pocket and hold it in place with double-sided tape. Stitch the pocket closed with variegated red embroidery thread. NOTE - Before sealing it completely, drop a handful of confetti stars through the top opening. 3. 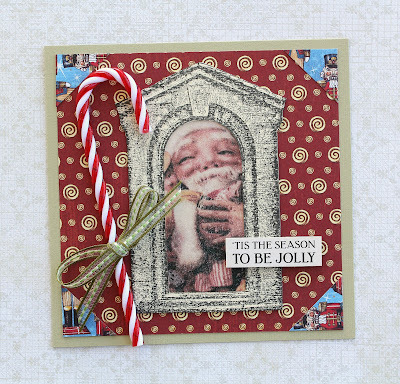 Cut three Christmas images from the Yuletide montage sheet and attach them to the pocket with tape. Add a Yuletide wordstrip, a ribbon bow, and a silver rhinestone. 4. 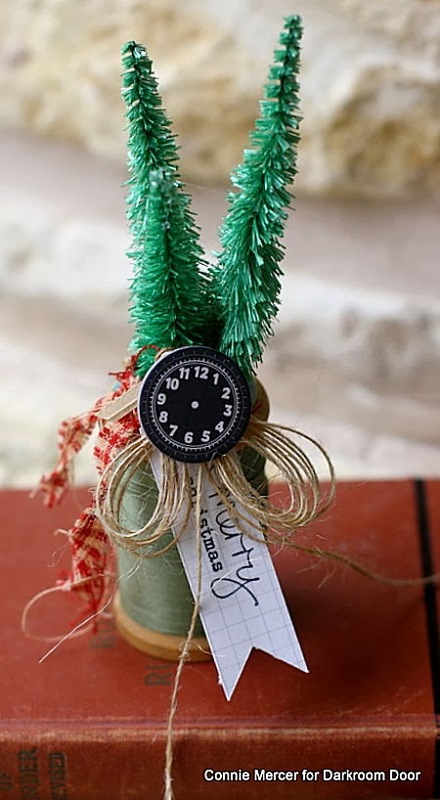 Punch a small hole through the top of the pocket so that it may be attached to a gift or hung from the Christmas tree. Hi there stampers! 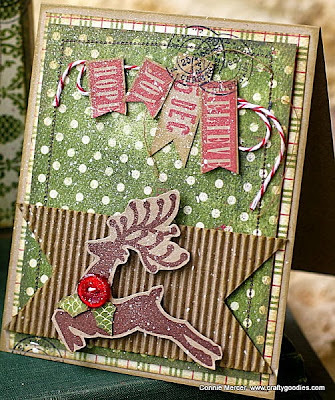 It's Rachel here today to share some card making ideas using the Essentials 13 Collection stamp sets! 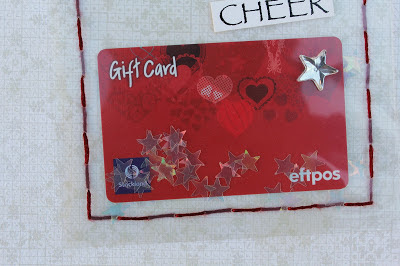 This first card is using the Enjoy The Ride Stamp Set. Stewart (aka the guy who manufactures the Darkroom Door rubber stamps and also otherwise known as my better half!) went to France earlier this year to ride his pushy up a few French hills and watch part of the Tour de France race. So to celebrate his acheivements (riding to the top of Alpe D'Huez!) we have designed a stamp set just for him and any other keen cyclists out there! For me, I love that we included a little chopper pushbike - just like the one I had as a kid! This card is very simple - I stamped the bike onto white card using Jet Black Archival ink and the sentiment using Vermillion Archival Ink. Mounted on red card using foam adhesive to complete. Very quick and easy, but stylish to boot! The Paint Splats stamp set was so much fun to design and even better to use as stamps! For those that love the look of paint splats but don't want the mess, this set is perfect for you! I've created two different cards with this set, the one above is using different inks with the splat stamp. The card below is using the single drip stamp, but with different inks to create a complete rainbow of drippage! The sentiment is from the Mail Art stamp set. The door image was stamped onto an alcohol ink background using Jet Black Archival ink. I love the quotes in this stamp set too! This card was created using the Japanese Calligraphy stamp set. We had the pleasure of working with SUIKYO, a well known calligrapher from Japan who created the artwork for this stamp set. It is beautiful! 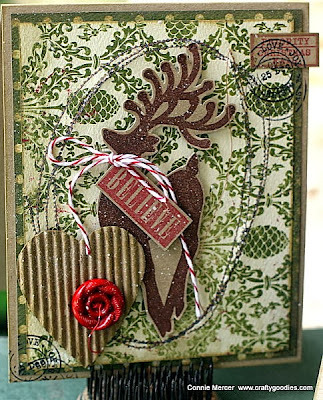 Teresa has also created some amazing cards with this stamp set which you can see here. 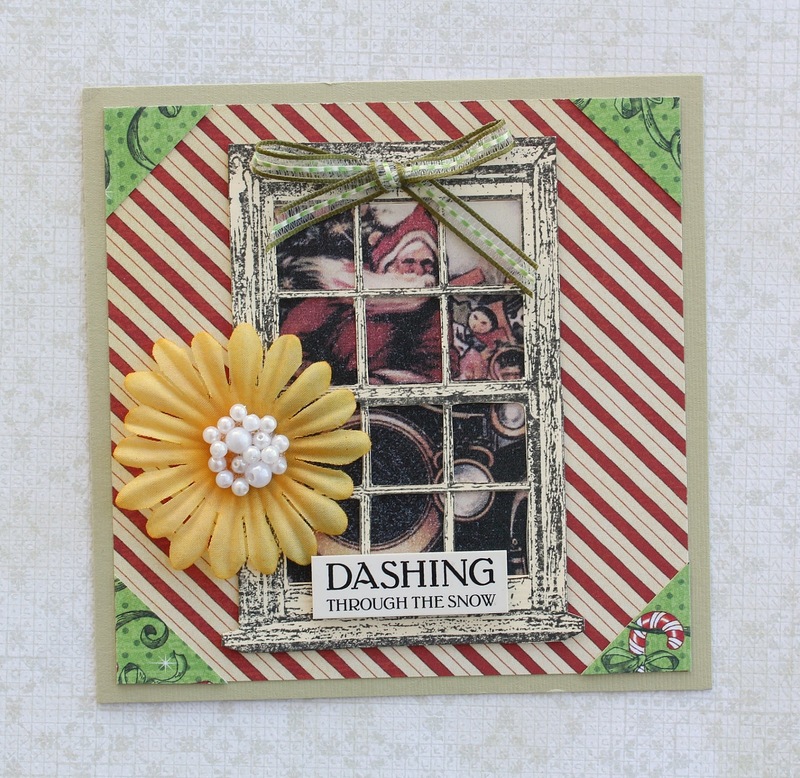 Last but not least, here's a card using the String Inspiration stamp set! 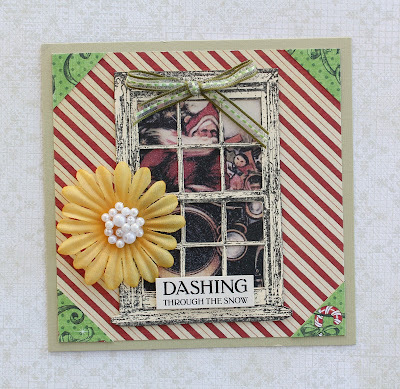 This set follows on nicely from the String Sentiments and Christmas Sentiments. This card was created by using all of the small butterflies in the stamp set with one of the words stamped along the bottom. Very simple and pretty. Of course the words can be used for so many things and they are long enough to cover the width of a 6" card base. I hope these cards have given you a little inspiration! You can find all of the Essentials 13 stamp sets here. If you'd like to receive my 'Stamping Inspiration' newsletter, which is usually sent on most Wednesdays, please sign up here! Set of Christmas Reindeer Cards! I wanted to share a set of cards I made using a Christmas set by Darkroom Door called Christmas Reindeer. We have tons of deer on our place, so I loved the deer images in this set. The images are stamped on Kraft paper using Archival ink (Sepia) by Ranger. I machine stitched a circle around the card for added interest and dimension. Want to receive more stamping ideas, tips and techniques? Join the Darkroom Door mailing list here! Christmas is fast approaching so today I have two Christmas cards to share with you featuring the Stitched Christmas Stamp Set DDRS122. I have stamped and heat embossed with white embossing powder two Christmas trees and some stars from the Stitched Christmas Stamp Set as well as the Wooden Frame Stamp onto kraft cardstock. 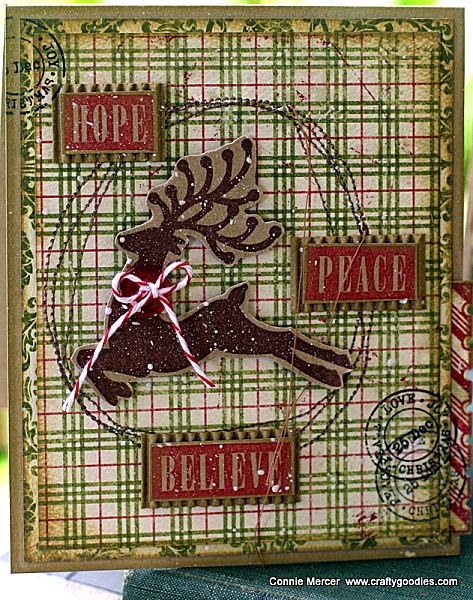 I have also embossed the sentiment and some more stars with Stampendous Embossing Tinsel in Vintage Mahogany. All elements have been layered together either with double sided tape or 3D foam and then sprayed and splattered with White Linen Dylusions Ink Spray. 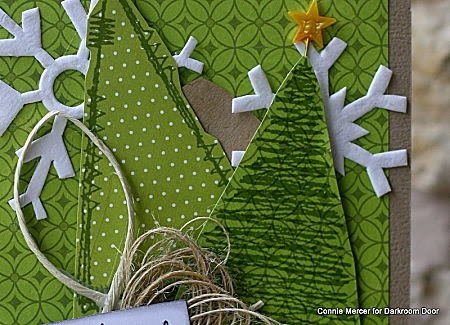 For the second card I wanted to use the Stitched Christmas tree in a different way so I created a banner for the top of the card by cutting off the trunk and turning the trees upside down. 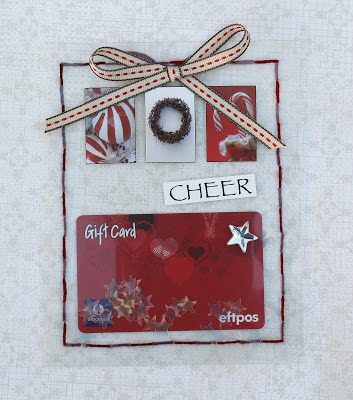 Hi everyone, Connie here with a card using Stitched Christmas rubber stamp set! The name alone had me hooked!!! Love the trees and love the sentiments!!! This is a 6" x 5" card. I used Wendy Vecchi's new ink, called Fern green by Ranger. 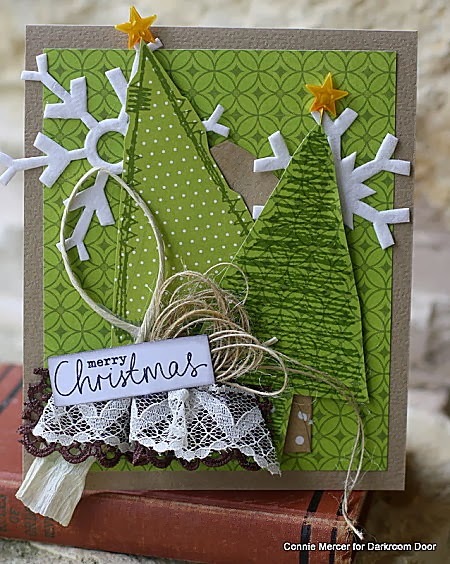 I stamped out both tree images and put them in a little envelope and began to build my card around that. 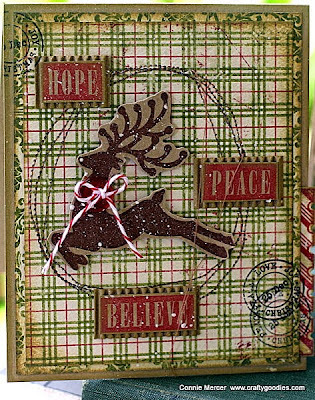 This a "junkin' find and I used the "Stitched Christmas" set for the sentiment. 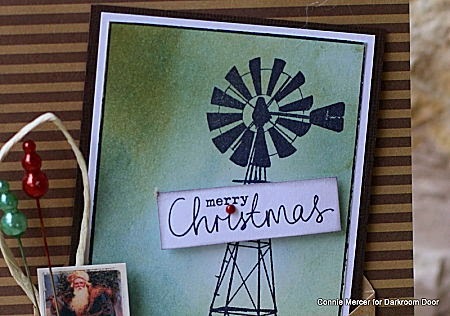 Next I created a Christmas card using the Windmill Photo Stamp with the Stitched Christmas sentiments.I put a Texas Christmas swing on it - hope you like! I got back into my scraps of paper to make this card. 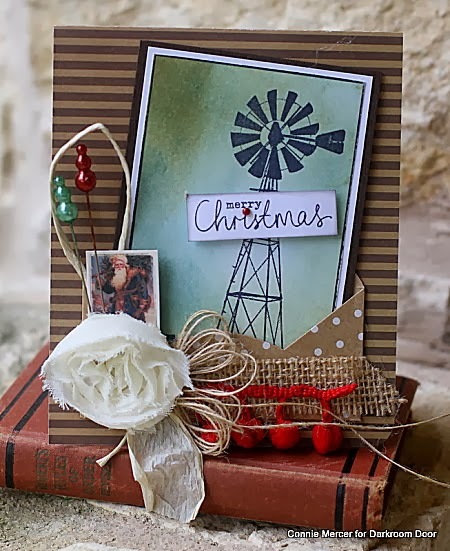 It makes me feel like I got something for free:) I stamped the windmill out on white cardstock and then inked it up with Tim Holtz's inks by Ranger. I used the brown, green and blue shades. The tag is stuck in a small envelope and I began to build around that. I also used the Dear Santa Montage. 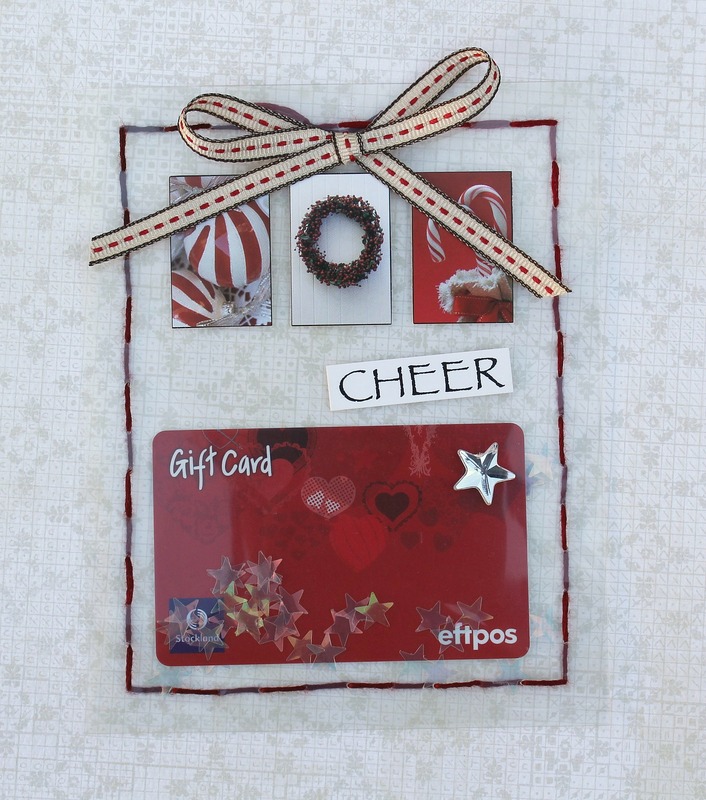 The sentiment is from the Stitched Christmas set. Now this one is a delicate and pretty project. 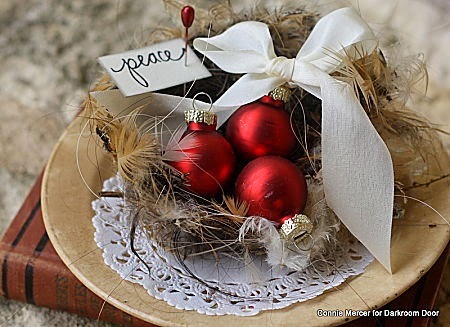 Adding a sentiment to your Christmas crafting! I used the sentiments from Stitched Christmas. It was perfect! Yes those are bird nests that I have collected. The top one is from our yard and the second one from my son's place in Indiana. They raise chickens and this one has feathers in it. 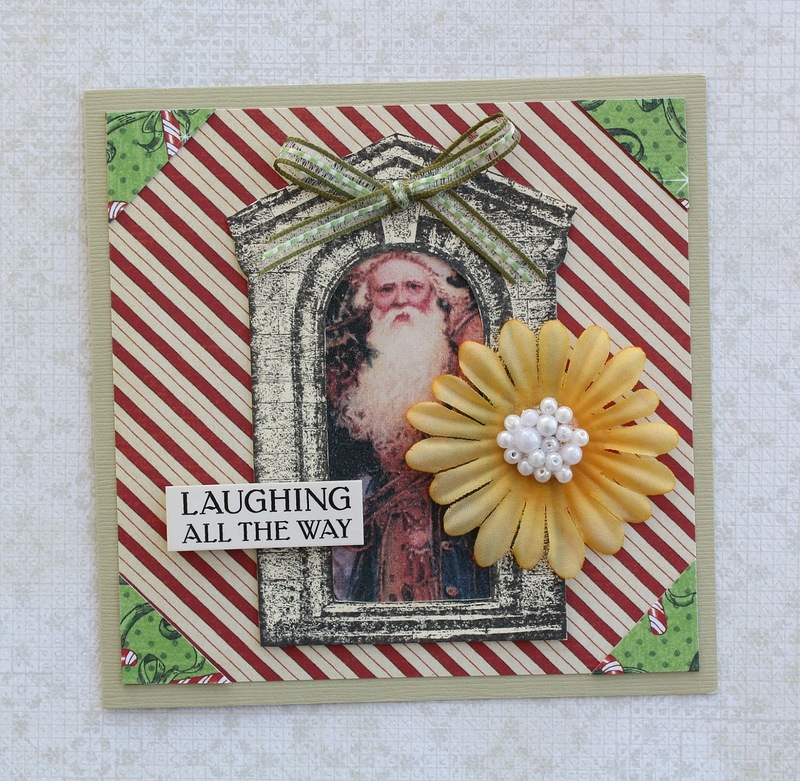 I used the Dear Santa Montage sheet and Stitched Christmas for the sentiments. The die is by Sizzix called Picture Wheel. The Santa images, on the Montage, sheet are perfect for this. 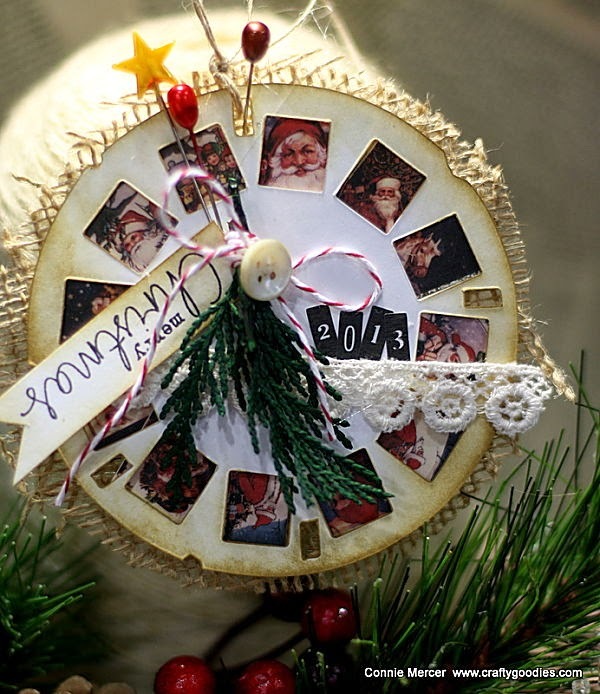 You will need to trim down a little and then tape or glue them to the back of the picture wheel cut out. after you have the images in, I backed it with a circle of burlap. 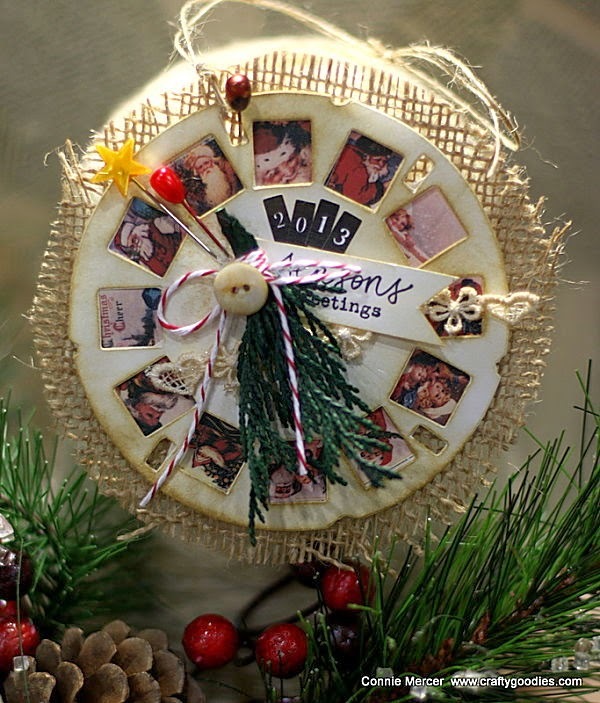 I stamped out the sentiment and added embellishments, to complete the ornaments. I hope you have enjoyed all of these projects! Thanks for stopping by!